Nothing changed at the top of the BOV Men’s League standings last weekend with Hibs notching a late win over Floriana in the top match to remain second in the standings alongside Starlites. The latter had the better of BUPA Luxol in a very high-scoring game. 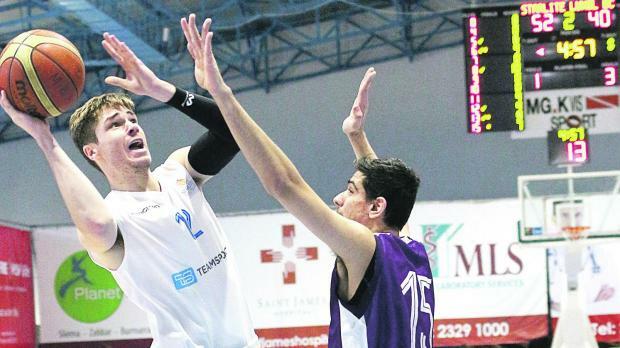 Gżira Athleta maintained the top spot with a game in hand after comfortably beating Balkan Fusion. Hibernians registered a double over Floriana with a win that materialised in the final five minutes of play when the Paolites outscored the Greens 20-8 after both teams had essentially shared the spoils till the 35th minute. Floriana took the first lead through a brace of hoops from Ian Theisen and despite a reply at the opposite end through baskets from Luca Tardito and Anton Axiaq, Kristin Baldacchino’s Greens still maintained a slender advantage with Gael Hulsen and David Bugeja leading their frontcourt. Late hoops from Tardito and Ivan Demcesen helped Hibs to close off the first quarter enjoying a marginal 24-23 lead. Midway in the second quarter Hibs looked they were going to take control of the match after they netted a 9-0 streak with Alvaro Lizaur grabbing five of the points. However, Floriana hit back and again re-opened the encounter with Hulsen and Theisen leading the team whilst Bugeja had to withdraw from the match due to injury. It was again a one-point game just after the change of ends when a Hulsen jumper made it 46-47. But yet again Hibs had a positive stretch as they netted once again 11 consecutive points this time in four minutes of play to move 58-46 ahead. A trey from Kieron Caruana and Kurt Xuereb revived Floriana’s hopes as they managed to neutralise the deficit and end the third quarter at par, 63-63. Hibs had a good start in the final rubber as Lizaur and Chad Patus sank in a three-pointer forcing Floriana to call an early time-out. By the fifth minute the Greens managed to again come within striking reach at 69-71 but here Hibs had a 7-0 run with a Lizaur trey, a Patus mid-range jumper and free throws from Roderick Vella. Although Hulsen grabbed two baskets off penetrations, Hibs closer to victory with another 8 points on the trot, thereby opening a double-digit lead and the game clock clearly in their favour giving Floriana no more chance to again recover and claw back into the game. Floriana: S. Pace 6, D. Bugeja 4, S. Borg, K. Caruana 3, K. Liivamagi 5, I. Arias 3, I. Thiesen 27, K. Xuereb 11, G. Hulsen 18. Hibernians: R. Vella 8, P. Attard, K. Sultana, L. Farrugia 3, M. Formosa, I. Bonett, L. Tardito 18, A. Axiaq 14, M. Matijevic, A. Lizaur 30, I. Demcesen 6, C. Cuschieri Patus 12. Referees: B. Vassallo, T. Mantere, M. Hraisha. A high-scoring game ensued between these two sides with Starlites GIG managing to register another league victory as BUPA Luxol could not keep up the pace throughout as they had a number of players. Jerrell Martin is now back in the States, Dirk Schembri was unavailable and promising youngster Keith Dimech not on the court again for the second game running and, according to reports, possibly Australia-bound for a trial in the near future. Indications of a game with plentiful points was evident from the tip-off as both sides relied a lot on their offensive ploys with some slack defensive pressure. A nine-point break, mainly through hoops from Cameron Ward and Alec Felice Pace, had Starlites opening a 21-7 lead in the sixth minute. Luxol did reply through Filip Sekulic and treys from William Ahlberg, CJ Cordina and Jean Paul Schembri to reduce the margin by half. But very late first-quarter points from Drew Sears and Jordan Stotts helped Starlites to a double-digit lead, 37-27, at the end of the first quarter. Early second-quarter long-distance shots from Vukassin Jandric and Ahlberg had Luxol coming merely three points away, 36-39. Starlites hit back immediately with an important 11-0 run where Robert Bonnici notched a trey followed by two free throws and then Nick Formosa added a shot from downtown. Luxol had to call their second time-out and although they did come off this one minute interval with a hoop, it was Starlites that kept their offensive pressure, on their way to an impressive 76-point tally in the first half, first with an 11-2 run, where William Darley had a trey and a jumper, and then late 11 consecutive points, with three Ward hoops, for a 76-49 score at half-time. The point-getting rhythm went down in the second half even though there were seven three pointers shared between the two sides in the third quarter. Sekulic and Ahlberg had one each for Luxol whilst Jandric added a couple of jumpers for the same Violets. At the opposite end, Bonnici, Ward and Darley also had a trey each and Alec Felice Pace added a brace and also the quarter’s last hoop as Starlites surpassed the century mark for 101-66 with ten minutes to go. The last quarter was a formality with Luxol reducing a bit the deficit with a late flurry of points as the encounter ended with both sides sharing an impressive 200 points between them. STARLITES: A. Felice Pace 18, N. Formosa 14, R. Bonnici 10, I. Felice Pace, C. Ward 20, M. Falzon, M. Scerri 3, R. Carabott 8, W. Darley 17, A. Sears 13, J. Stotts 11. LUXOL: CJ Cordina 8, V. Jandric 22, J. Cefai, P. Engelbert, JP Schembri 6, W. Ahlberg 27, F. Sekulic 19, S. Cappello 4. Referees: T. Mantere, Z. Dobrosavljevic, K. Dworniczak. Gżira Athleta kept top spot in the standings for this week, albeit playing a game more than the two teams at their heels, when they registered a comfortable victory over Balkan Fusion. The Balkans tried their utmost to minimise the damage against a superior opponent when playing with six players on the day. They did offer good resistance in the first eight minutes but then Gżira took command of the game as they managed to distance themselves by the half way mark. Nikola Bozovic and Stefan Todorivic kept Balkan trailing with a single point in the early stages as Gżira, who did not utilise the injured Connell Crossland whilst fellow import player Julio Guity was only used in moderation, relied on Vincent Pace’s and Matthew Gouder’s points in the opening minutes. A 13-point stretch, including five points from Luca Stefanovic, set Athleta going and although Balkan finally replied through a Miguel Gauci Montaldo close-range hoop, the victors continued to cement their superiority with another run, this time 14-0 which helped them to go in for the interval break at 51-22 in the lead. The game continued with the same tempo in the third quarter as Gżira Athleta continued to extend their lead with Peter Shoults and Nikola Vasovic grabbing a number of hoops while the young tall twins Ryan and Eric Abela managing also to notch a respective bucket. Balkan had their best moment midway in the last quarter with a ten-point run with Kovacevic getting half of the points. But Gżira Athleta were firmly in control of the game and they then came very close to register the century with Nathan Xuereb grabbing most of his points in the latter stages of the match whilst Vasovic ended as the side’s top point-getter with a brace of late hoops. GŻIRA ATHLETA: N. Vasovic 22, C. Crossland, P. Shoults 10, L. Stefanovic 14, R. Abela 4, N. Xuereb 11, M. Gouder 13, V. Pace 16, E. Abela 2, J. Guity 6. BALKAN FUSION: N. Bozovic 21, T. Grech 4, A. Schembri 2, M. Gauci Montaldo 15 S. Todorovic 11, N. Kovacevic 8. Referees: T. Mantere, D. Torok, I. Simic. Gżira Athleta (8-3) 19; Hibernians (8-2) 18; Starlites (8-2) 18; Floriana (5-5) 15; Luxol (4-7) 15; Depiro (3-7) 15; Balkan Fusion (0-10) 9. Note: Balkan Fusion deducted one point due to a walk over.